This year in Magical Sabbatical, we are exploring “A World of Magic”. Each month, we learn about the magical practices of a different civilization. Our exploration spans from ancient to contemporary times. Together, we tap into the power of these magical societies, infusing our own modern practices with their ancient magic. Included in our discovery are each culture’s associated myths and lore that have captivated imaginations for ages. This set accompanies our December 2018 Magical Sabbatical class. If you would like to join us for December’s Magical Sabbatical class, click here. This December, we are exploring the powerful energy of Ancient Norse. 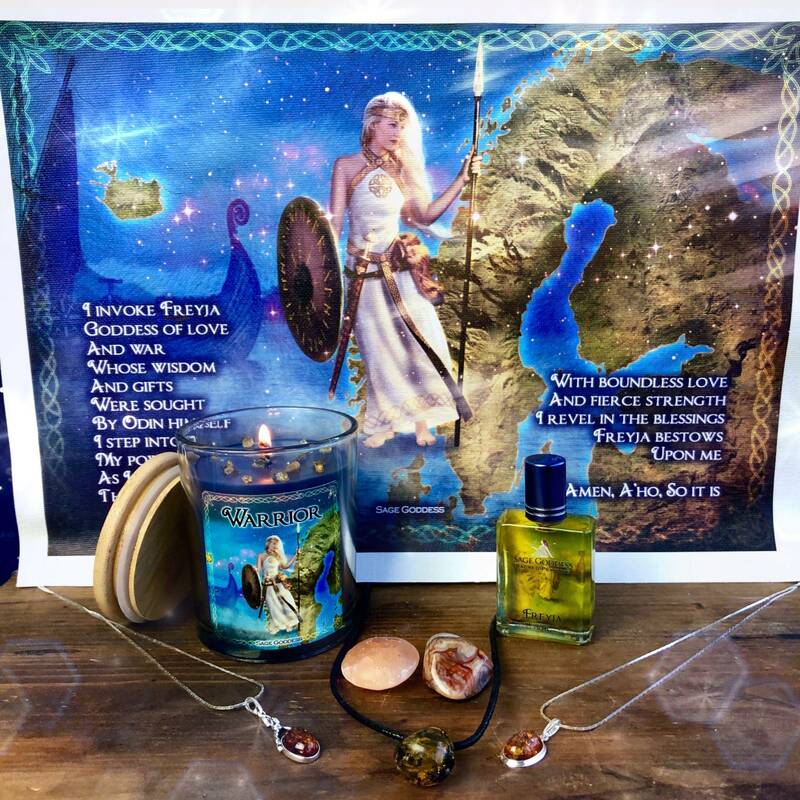 Our December 2018 Magical Sabbatical Set – Magic of Ancient Norse: An Untamed Force of Nature, the Embodiment of Freyja is filled with tools intentionally chosen to help you step into your sexuality and Divine power! 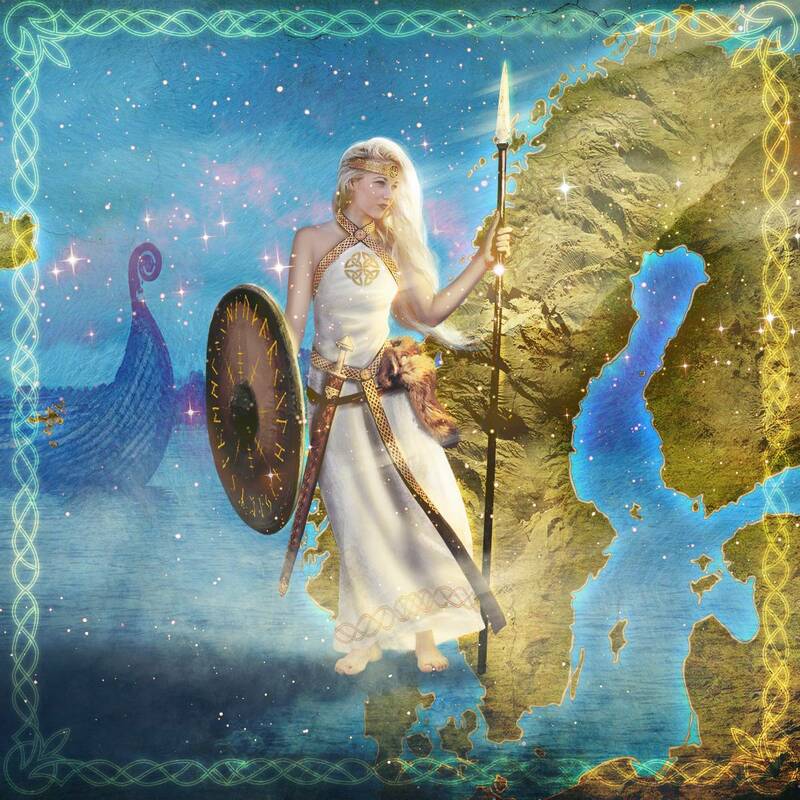 Freyja is the Norse Goddess of love and war. She is gentle, beautiful, and seductive. Her love is boundless, and her courage has no threshold. Freyja is the goddess to call upon when you feel your confidence needs a boost. She fiercely encourages self-worth as it relates to our own beauty and sexuality. Freya is an untamed force of nature whose wisdom has been sought by Odin himself. She is the one who taught Odin Seidr (trance) magic – an aspect of her shapeshifting magic, and he in return, taught her the ancient language of runes. During this Sabbatical class, we will learn how to shapeshift as she did, with fierce strength and boundless love – for love is always the driving force. We are going to stand in our own circle of fire, cast our own fate, and revel in the power that goddess Freyja spirit bestows upon us. Now, I will not reveal too much here, because we are excited with anticipation to explore the stories and uses of these special products in our classroom this December. This is a special discussion that you won’t want to miss! 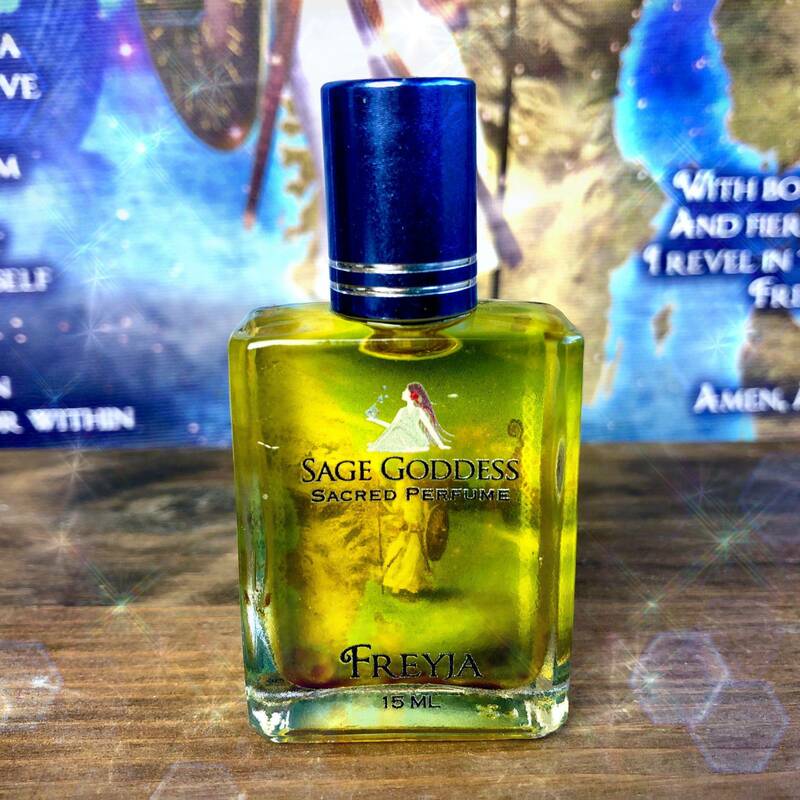 One (1) 15 ml bottle of Freyja Perfume, blended with pure essential oils of amber, geranium, and lily attar. Each bottle is infused with a rose quartz chip stone to fill you with unconditional love. 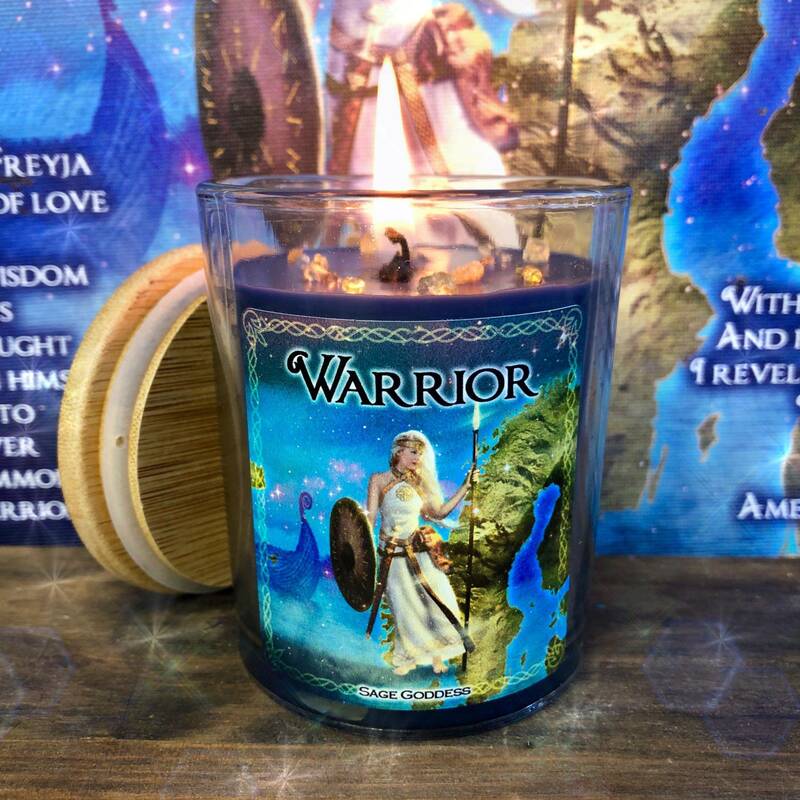 One (1) 6 oz Warrior Candle, hand-poured with deep blue soy wax and blended with my Freyja Perfume. Each bottle is also infused with a rose quartz chip stone. One (1) tumbled orange selenite (about 0.75-1″). Orange selenite, which is rarer than white selenite, is a Sacral and Crown Chakra stone that activates your spiritual connection and your personal sense of creative power. The orange light of these pieces taps into the sensual energies of desire, creativity, and abundance. One (1) tumbled laguna agate (about 0.75-1″). Laguna agate harmonizes with the lower chakras and is known as a stabilizing and strengthening gemstone. This stone ignites your inner fire and sparks Life Force, creativity, and sexuality. You will also receive one (1) bonus intuitively chosen amber pendant. We will choose your pendant from our gorgeous selection of Amber necklaces! 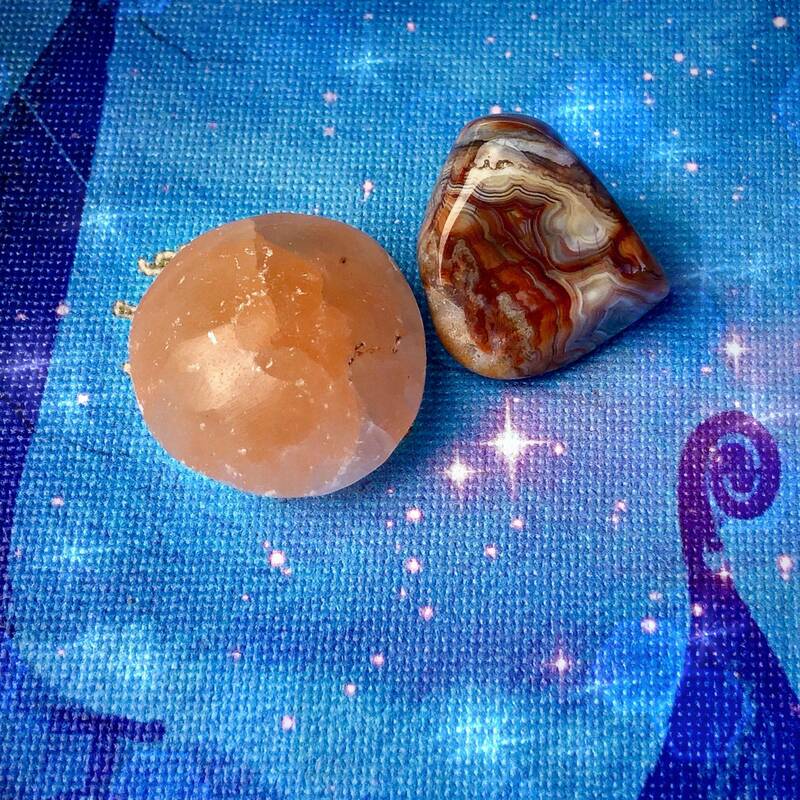 Amber is a stone of the Light, promoting abundant warmth and strongly aligning you with its nurturing energy. Amber also activates the Solar Plexus, bringing health and igniting your confidence and personal power. Please allow for variation. You have the option of ordering your December 2018 Magical Sabbatical Set – Magic of Ancient Norse: An Untamed Force of Nature, the Embodiment of Freyja with one (1) gorgeous piece of 8×10” SG canvas art. This canvas was designed right here at SG Headquarters, to help you invoke your fierce, inherent power. 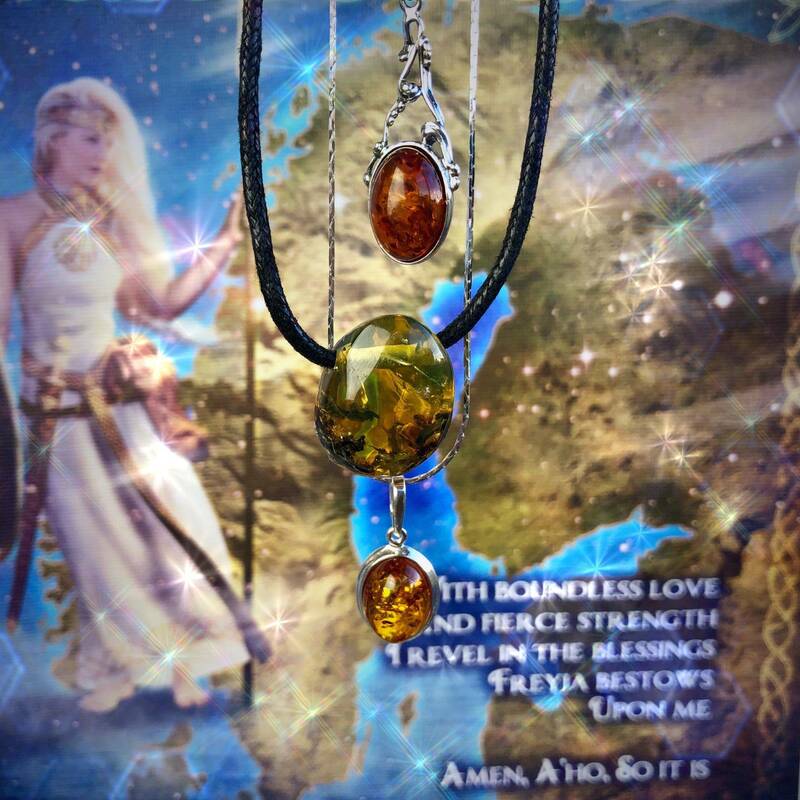 This listing is for one (1) December 2018 Magical Sabbatical Set – Magic of Ancient Norse: An Untamed Force of Nature, the Embodiment of Freyja, as described above. Choose the offering you are called to from the drop-down menu above. Yours will arrive lovingly parceled along with a single leaf of white sage and a parchment describing the properties of the stones. Note: This perfume is made with natural essential and carrier oils, and may contain fragrance oils. Cap color, chip stone, and color may vary slightly. For external use only. *Please always burn candles on a heatproof stable surface, and never leave a burning candle unattended. Love this set. The freya perfume smells amazing as does the candle!